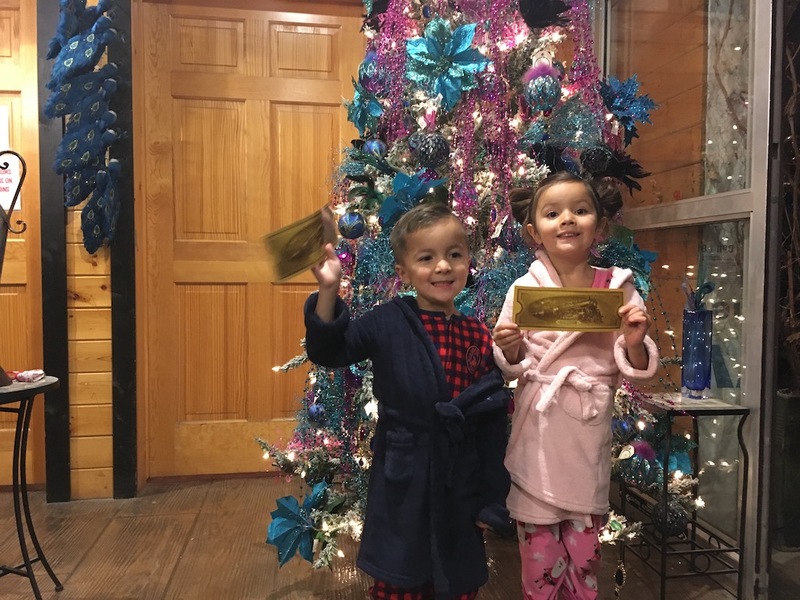 Last year, I learned that there was a Polar Express train ride being offered at Aspen Crossing in Mossleigh, Alberta (a little town, just south east of Calgary). I remember looking into it at that time, but just feeling like the season was too busy for us to add one more thing to our plate…so I left it alone. This year was a different story and I really felt like it would be a perfect year to take the kids. They are 4-years old now and are really acting wondrous about all things these days. I knew it would be right up their alley! The first thing I had to do was convince Darren that we should buy tickets for our family, which actually wasn’t very easy. At a starting price of $57 per ticket (plus tax) this is not a cheap excursion and it definitely required some consideration. Initially he joked that I should just buy three tickets but then he finally got ‘on board’ (pun intended) and we took a chance! When you arrive for your train ride, everyone meets in a common area. 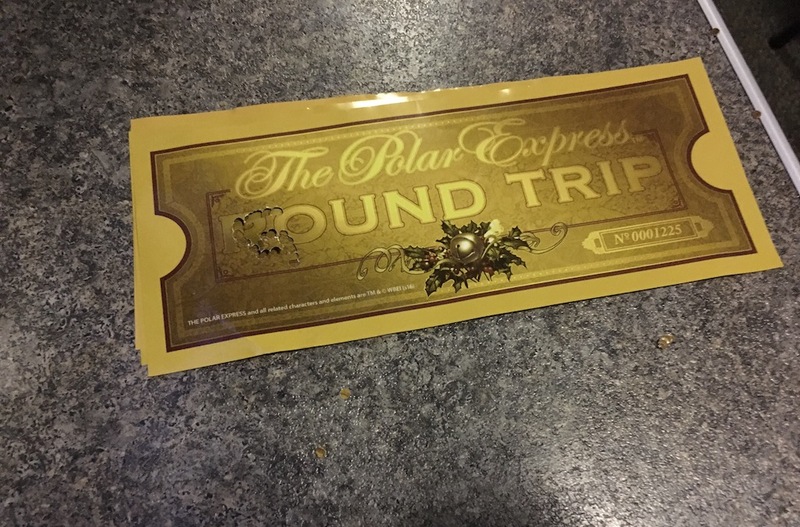 You find the table that holds the tickets and they will take your name and give you your train tickets – not just any ticket though, a replica of the ‘golden ticket’ that you see on the movie. It was fun to start the experience this way! The kids really enjoy receiving their own ticket and I think it created a little bit of a buzz for everyone. The train loading process went fairly quick and, just like on the movie, everyone loads the train and is greeted by the conductor! Note: he is in character but very happy…which was a relief since Gray and A were a little nervous about him…he is historically a bit of a grouch. Can we talk about seating for a moment? There are various seating options you can purchase with the cheapest being in economy – and that was the max we were willing to spend. I can now assure you, they were great! We got our own table and chairs and had a window – and that’s all you really need to enjoy the ride and outside displays. I wouldn’t hesitate to recommend the economy section to anyone at all. Early into the train ride, everyone receives a Polar Express mug, filled with hot chocolate, as well as a cookie. Very ‘animated’ waiters serve these and I thought they did a good job of getting everyone excited about the ride. Most of the families were starting to take photographs and, when they asked the staff for assistance with taking them, no one was ever denied. Shortly after that, we enjoyed in-train visits from: The Conductor, The Hobo, Billy, the Hero Boy, the Know-It-All-Kid and, eventually, Santa Claus. The only character that didn’t make an appearance (that of course Miss A asked about) was the Hero Girl. I simply told her that she must be not feeling well or on a vacation and she easily accepted it. On our journey, we rode by several displays including a stop at Billy’s house (where he actually boards the train) and a stop at the North Pole where elves are excitedly dancing and Santa Claus boards. There was a lot of excitement around that – especially when he started making his way down the isles, gifting the children with their own Sleigh Bells. 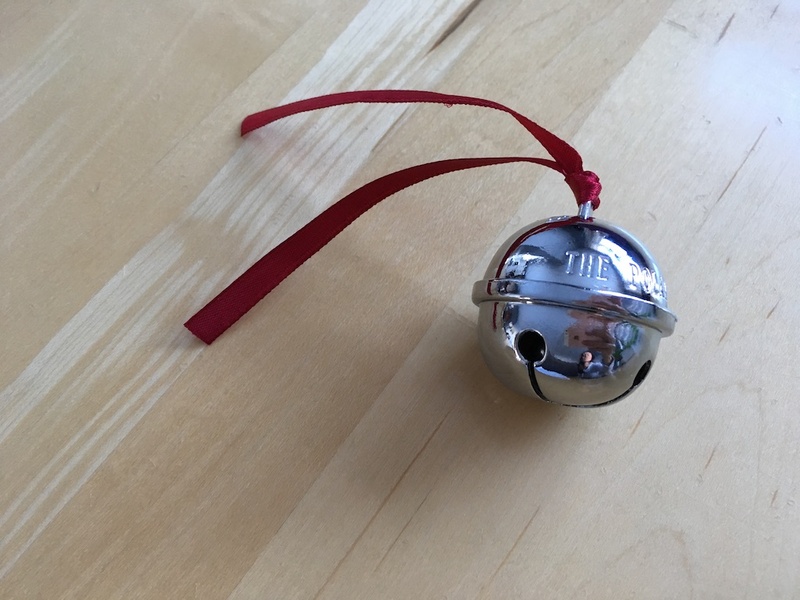 My heart, honesty melted, when Miss A placed her bell into her housecoat pocket – just to replicate what she had seen on the movie. Swoon!!! 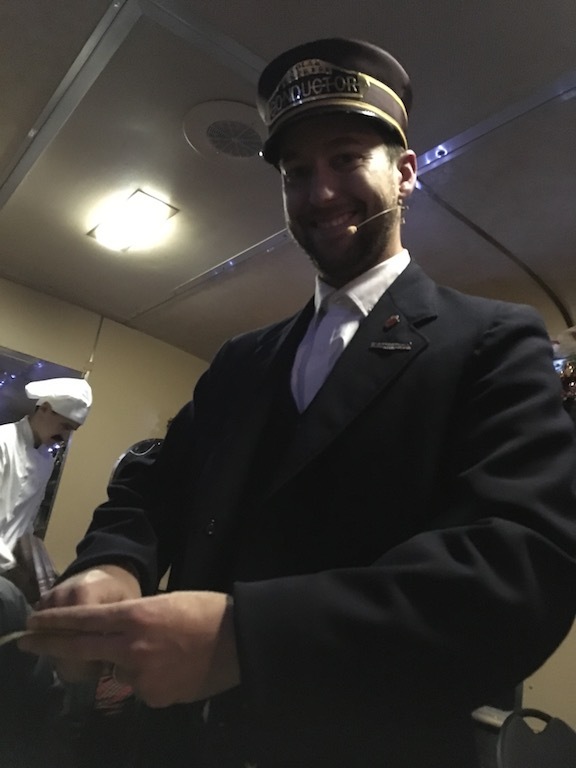 On the ride back to the station, there is a book reading (of course, it’s the namesake book – The Polar Express by Chris Van Allsburg) and the children are encouraged to dance and jingle their sleigh bells in the isles while the Waiters and parents (NOT Darren! lol) sang Christmas carols. I have to say that the experience of this activity exceeded both my husband’s, and my, expectations. On top of the fact that there is a ride to the North Pole and a visit from Santa, there were many of the characters from the movie that made appearances on the ride and did a great, and convincing, job. Not only did they ‘look and dress’ like the characters, they were actually ‘in’ character as well and engaged with the passengers regularly. There were actually times during the ride where I felt the same magical feeling watching the kids as I did in Disneyland! Of course I’m not saying this ride is the same as a trip to Disney, but certainly there is some ‘magic’ that comes with the experience of riding this train. Over all this was a really fun activity and something I think we would consider doing in future years again. Even Darren admitted that this excursion exceeded his expectations and said he would recommended it to others and will consider it again in the future for our family. Most importantly, the kids LOVED it! Bring your kids in their pyjamas! It is encouraged and most of the kids (and some of the parents even) wore them. Pack a handful of plastic bags. You get to bring the Polar Express mugs home when you leave and, although you get a bag, we were offered 1 bag for every 2 mugs. I was a little nervous when I heard them ‘clanking’ around. It might be a good idea to be able to wrap them up a bit. Even a large baggie, for each passenger, would work well. Bring your coats, etc. from your vehicle. There is a period of time where you do wait in line to board the train and it is outside. Head out there a little early and take some time to browse the gift shop. They have some cute, little things and it was nice to get some souvenirs. We didn’t go through the gift shop, ourselves, until after the ride and it was totally jam-packed! Save your sanity and go through it beforehand. If you’re up for a little pre-ride dinner, there is a restaurant onsite inside an actual train car. I had a look at the menu and I thought it looked decent. Because we booked our tickets rather last minute the restaurant was full and I wasn’t able to get reservations, so we will have to try again next time. A mom-friend has told me that the food there is good! …just call to book early! If you want to make a little adventure out of your evening, check out the Mossleigh Bar N Grill. I had asked some staff at Aspen Crossing for a suggestion of where else to eat, since the onsite restaurant was full, and they had suggested this spot. It is very close to Aspen Crossing and the food was decent (and so was the wine actually). Our ride was on a Sunday night, which happens to be their ‘Kids Eat Free’ night at the restaurant– so it was a total score for us! Our family of four had: four entrees, two glasses of milk, a glass of wine, and a premium beer and our entire bill (with tax) was $38.70! Unfortunately, since I started writing this blog post, all tickets for the 2016 Polar Express have sold out. Having said that, I noticed a number of tickets available for sale on some of the buy/sell sites (including Kijiji). I took the liberty of contacting Aspen Crossing to make sure the tickets are transferable and I was told that purchasers of re-sale tickets should just ensure they have both the confirmation number as well as the name the tickets were bought under. If you haven’t considered tickets to this fun, festive evening out, I would definitely recommend it! Just be sure to purchase your tickets early to avoid disappointment! This is great – thank you for the ONLY review on this trip… Perfect timing as I was looking at Coach vs the lower budget train car like Lomand… sounds like only the seat fabric is the $60 differential. Also good tips on PJs and where to eat. My kids will be so excited. Thanks again! Hi Angie – you are most welcome! I struggled, too, with trying to figure out whether we should upgrade or not…and it’s already a ‘pricier’ family activity. I’m glad you found it helpful! I’m sure your family will really enjoy this activity! We just bought our tickets for our ride this year and I’m so excited for the kids (we haven’t told them yet)! We are going with 10 of us. Decided to do this as a family instead of a gift exchange this year. I’ve bought matching jammed for kids but would like to know where you got house coats from. They are cute! We’ve never watched the movie…guess I’ll out that on the list of things to do before we go out! Thanks for the review Dionne! Wow! That’s a good sized group! I love that you are doing this experience instead of material gifts…I am a huge advocate of that (don’t you just find there is so much ‘stuff’??). 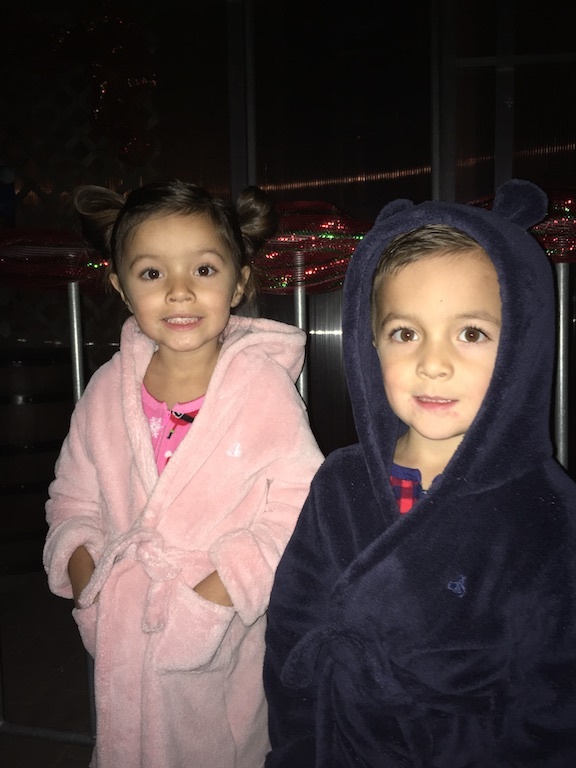 Matching PJ’s…I need to get on that for this year I guess! Thanks for reminding me! The house coats are from The Gap ( #GapLove )…aren’t they adorable? I think we gave them to the twins 3 years ago and have sort of been milking their wear out of them (they still squeeze into them sometimes…I should pack them away in their keepsake boxes soon). 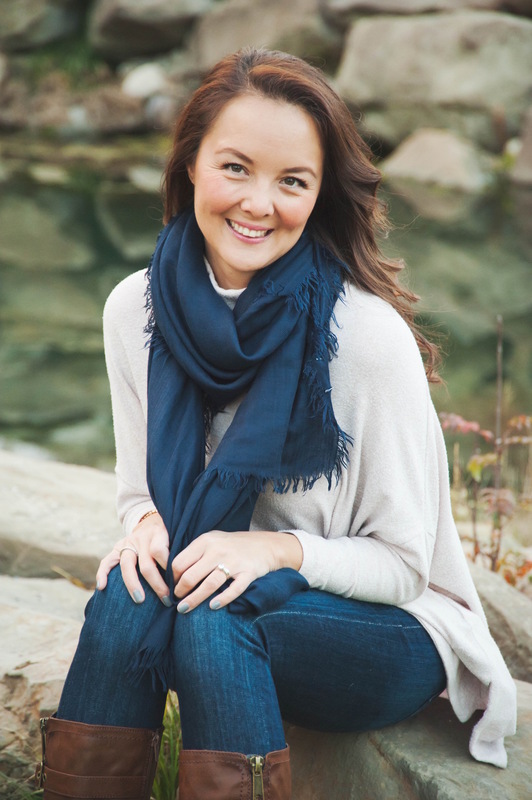 I was just on the Gap website (they have 40% off plus 10% off right now) and I think I saw something really similar just today – you should check it out! Definitely watch the movie well ahead of going (maybe your kids will watch it over and over again like mine like to do). I would suggested looking for the movie sooner, rather than later…I have been told it sells out quickly and can be hard to find over the holidays. Good luck! Let me know what you think! I’m so excited for you and your family!